I found myself with a lot of milk leftover this last week. We usually use up our weekly supply of raw milk from our cow share (from the lovely Nutmeg the Normande cow), but somehow we ended the week with nearly half a gallon of milk in the fridge still. Not wanting to throw it out to make room for the new supply – what a waste of a beautiful product it would have been – I decided to do something about it. I've been wanting to try my hands at Dulce de Leche – the gloriously sweet, gooey, creamy caramelized milk from Latin America - so this seemed a fortuitous moment. 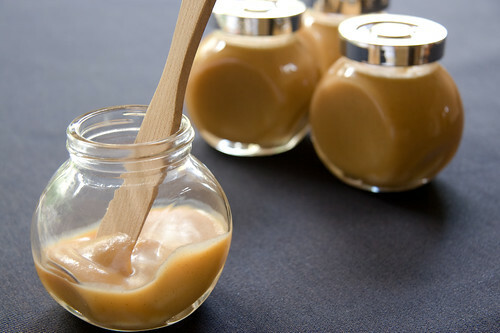 Unfortunately, most Dulce de Leche recipes I googled gave instructions for making "homemade" Dulce de Leche from store-bought canned Condensed Milk. How that became "homemade" I'm not entirely sure. Even my dear friend David L. had his own Sandra Lee moment. I needed to find one that uses whole milk so I turned to a different source. There is a similar product in French cooking called Confiture de Lait, or simply milk jam in English. There are plenty of Confiture de Lait recipes, calling for different proportion of milk and sugar, some call for using vanilla, or even the addition of rum. A little confused, I had to figure one out for myself. Many recipes I saw add a whopping 500 grams of sugar to merely a litre of milk – that's only a quarter of a gallon or just four pints. That's just crazy. I didn't want to end up with caramelized sugar with a hint of milk. I wanted to preserve the creamy deliciousness of Nutmeg's milk, so I used only half that amount. I know I'd have to cook it longer to compensate for the missing sugar and to reduce the milk to the proper texture. I also knew I'd add a little salt, not to make it salty but just enough to round out the sweetness. My experiment turned out beautifully, as you could see in the picture above. I wish you could taste it as well. Oh, wait, you could, you just have to follow to recipe and make it yourself! Add milk, sugar, and salt into a pot large enough that there are a few inches between the level of the milk and the top of the pot. Cut the vanilla pods lengthwise, scrape the seeds from the pods and add everything into the pot. Turn the heat to medium high, whisk or stir the mixture constantly until it comes to a full boil. Turn the heat down to barely simmer, and continue to cook, uncovered, for 3 hours. When in doubt, turn the heat lower. If the heat is to high your milk will boil over and develop a rough skin on top, which won't dissolve no matter how much you whisk later. Whereas when the heat is too low you'll just have to cook it longer, no harm done. Check the consistency of your confiture at about 2.5 hours. The consistency you are looking for is a loose caramel. (The confiture will thickens a bit after it cools.) This batch took just over three hours to reach the consistency I like. When it gets there, remove the vanilla pods, whisk the confiture until smooth. Pour into small jars and let cool. When the confiture cools down completely, put the lid on the jars and keep in the fridge. Don't ask me how long it keeps. I have no idea. I'm sure it'll all be gone before it goes bad anyhow. *The classic Delce de Leche doesn't have vanilla in it, but the classic Confiture de Lait does. I adore the beautiful flecks of vanilla in my confiture and love the aroma it adds to it. Whether you add it to yours is entirely up to you.